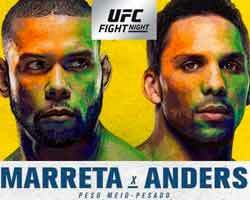 Review by AllTheBestFights.com: 2018-09-22, some good exchanges between Thiago Santos and Eryk Anders but it is not enough to get three stars: it gets two (UFC Fight of the Night). The black belt in Brazilian jiu-jitsu Thiago Santos entered this fight with a professional record of 18-6-0 (72% finishing rate) and he is ranked as the No.19 middleweight in the world. Thiago ‘Marreta’ has already fought three times in 2018 beating Anthony Smith (Thiago Santos vs Anthony Smith) and Kevin Holland (Thiago Santos vs Kevin Holland) but between these two bouts he lost to David Branch (David Branch vs Thiago Santos). His opponent, Eryk Anders, has a mma record of 11-1-0 (73% finishing rate) and he entered as the No.32 in the same weight class. He has fought twice in 2018 losing to Lyoto Machida (Lyoto Machida vs Eryk Anders) and winning over Tim Williams. Santos vs Anders is the main event of UFC Fight Night 137. Watch the video and rate this fight!